The Business School of SLIIT bestowed Bachelor of Business Administration (BBA) Special Honours Degrees recently. Dulara Achinthana Athukorala received the SLIIT Gold Medal for Academic Excellence and she was also presented with the Best Performer Award for Accounting and Finance Specialisation sponsored by CIMA. The SLIIT Merit Award for Accounting and Finance specialisation sponsored by Bank of Ceylon was presented to Isuri Chamathka Fernando. Lankabell was the sponsor of the Best Performer Award for Human Capital Management Specialisation which was clinched by Welhena Liyanage Amanda Udani. MIS – Best Performer Award for Management Information Systems Specialisation, sponsored by Epic Lanka Ltd., went to Weerakkody Gayathri Kansumali De Silva. 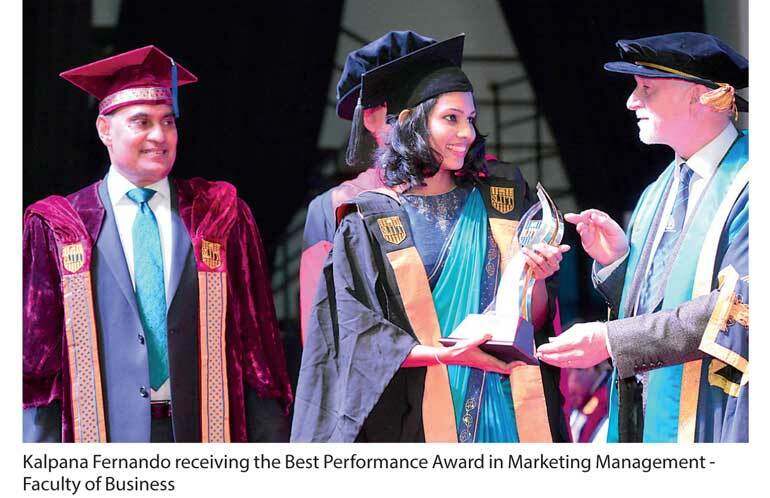 Hemas Manufacturing Ltd. sponsored the Best Performer Award for Marketing Management Specialisation presented to Kalpana Madushani Fernando and the QM – Best Performer Award for Quality Management Specialisation was granted to Ayesha Nirmani Abeykoon.